It's time for a contest, and not some lame contest where all you get is a crappily made t-shirt. This contest offers a treasure trove of novelty junk that could surely have bought Manhattan or some other island back in the early days of screwing over American Indians. There are two prize packages to be had and these will be awarded to the two LabSpaces members who have the highest point totals for the month. Both of them are pretty damn sweet though. 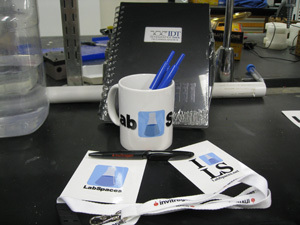 Package #2 has 2 IDT clickable sharpies, an EtonBio Pen, an invitrogen Pen, an Invitrogen Lanyard, 2 LabSpaces stickers, an EtonBio color-changing coffee mug, AND a LabSpaces Bumper sticker! Finally, you get to choose ONE of 4 different T-shirts (while supplies and sizes last). I have a bunch of the IDT shirts in small, medium and large. I have various colors of the EtonBio shirts in small, medium and Large, and I have only XL Invitrogen shirts. How do I earn points?? Good luck, and read the rules below! Contest Rules: You must be a registered LabSpaces member. Don't cheat. LabSpaces bloggers aren't eligible for the winnings. You must live in the contiguous United States for me to ship this stuff to you for free. If you live outside the US, I can go down to the post office and figure out how much shipping will cost (It's in the basement of my building). I'll cover $10 worth :P You can only win once. Don't make multiple accounts. Excessive comment spamming will get you disqualified. I reserve the right to review points totals for validity. Don't forget to visit the contest sponsors! Next: THE FaceBook for science is dead: What's next? What you mean I can't win a prize! This is BS. /quit Labspaces blogging. Wow I can't believe I allowed myself to post that. Note to self, no commenting when I am really tired. My grammar is bad and my jokes are a lot less funny ;). What no free schwag for bloggers? Actually better not, that way I don't have to deal with any FTC regulations. Why not save yourself the effort and just send me the schwag now? Haha, you'd be the winner this month for sure!